Another Yarn Club – oriented post – but oh, how much I love this yarn club. If perhaps I was feeling a little jaded from market preparations and wholesale orders over the past couple of months, this yarn club has got me way inspired. Like, crazy inspired. Is it too much to say that I *love* all the people in the yarn club? The emails, the Rav board discussions, the feedback – just makes me all warm and fuzzy. And in return I just want to go even further, wow their socks off, give them my yarny heart and soul. 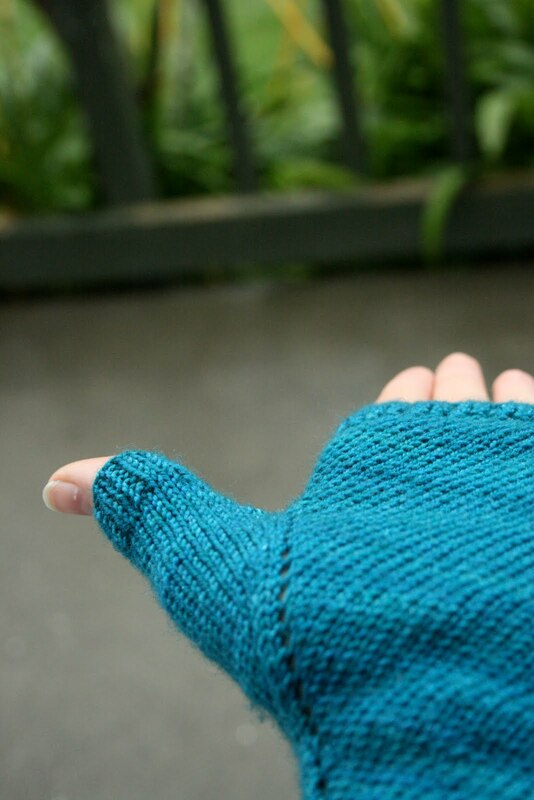 As pretty much everyone, as far as I can tell, has now got their parcels of goodness, I just had to share pics of my first Diagon Alley mitt in Peacock in the Parlour (a yarn club exclusive). Notice how the knitting is on the bias? *swoon* Once the second mitt is done, there’s some Mystery Machine destined for the same fate. The pattern is designed with variegates in mind, so a bit of green and purple should be just the ticket. From the feedback so far, lots of people would like some sort gauge as to the ‘mood’ of the colours for the yarn club, so they have an idea if they will fall in love with the colours. There are also some new twists to this Yarn club. There will be TWO colour ways each month! There will be a semi-solid and a variegated dyed especially for the yarn club each month. Mystery Escape: Each month I will close my eyes, pick a colour and post it on it’s merry way. Plan ahead: Each month I will email you what the colour ways are, and you can pick which one piques your interest. Note – these won’t include images, just a description of the colour. These yarns will be completely exclusive to the Yarn Club, and will not be sold at any point online. If there are any remaining skeins, they will be available to Yarn Club members to purchase, or will be offered for sale at Craft markets as limited editions. Do you feel special yet? I’ve also heard some don’t like surprises. So the extra treat in the Yarn Club will always be a coordinating stash bag, to keep your yarn organised. Last, but not least – the part I am most excited about. Alice Yu, of Knit Nation and Socktopus fame, is designing patterns! And they won’t just be socks, there will be a few surprises, and knowing Alice, some gorgeous patterns. Alice has loads of experience designing patterns, and know how to aim them at just the right level so they are interesting and beautiful but not completely scary if you’re only new to knitting. If you do have any trouble with the patterns, I’m available to answer questions and give tips to help you on your way. Pricing and sales dates to be confirmed – but it will be around mid-june, with the first out not long after. Hooray!